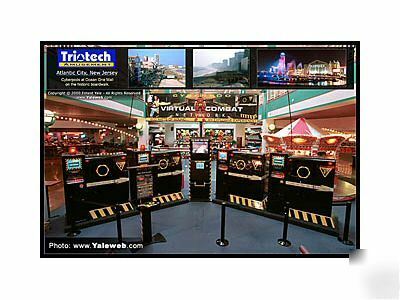 The Ultimate Immersive Multiplayer Arcade System! Prepare yourself to attract huge crowds by moving into an unprecedented world of interactive multiplayer gaming system. Most likely, you already know about high-tech virtual reality equipment. Unfortunately, it comes with an expensive price tag, it's hard to maintain, and difficult to play. The Cyberpods multiplayer system combines a player's dream of an "out of the ordinary" experience, while it fulfills the operators needs to get the very best virtual reality experience without "going broke". The cockpit is made of enclosed state-of-the-art fiberglass structure, featuring a sound proof barrier to provide awesome sound! Inside is the most powerful sound system ever to be put into a gaming system. With it's extraordinary Sound-Sation-Seat, you can't help but be immersed into explosive action that may literally cause you to jump out of your seat. Straight forward and easy to use controls make it possible for beginners to feel at ease while offering advanced controls for the pros. Also, the attractive joystick console is adjustable to provide maximum comfort while playing. The CYBERPODS are interlinked with the PODSERVER. The PODSERVER assists players in gaining easy access to the Cyberpod environment. It also regulates the network and provides computer controlled mercenaries when it detects that only a few players are playing. The PODSERVER provides a huge selection of maps, that will give your regular players a new experience every time. The PODSERVER is 7' Feet Tall with a 27" TV mounted at the top playing a pre-sell commercial for the ride. This makes for Increased Sales through Tournament Play! Scores are displayed on a 15" Monitor built into the PODSERVER so that at the end of each tournament each player can see their score. A printer can be added to print out score sheets. This system was purchased new for $39,000 in April of 2000. The remaining 50% will be due when Delivered.